Following a long period where magnolia has been the number one paint choice of the nation, apparently we have changed our tastes! 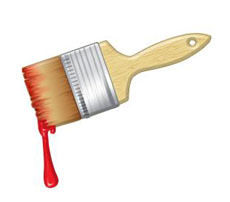 According to a survey by B&Q, our new favourite paint colour is red! And not only that, but its sales outstripped the paler shade two to one! It would appear that after years of painting our interiors magnolia to appeal to potential buyers, we have decided that as the housing market is sluggish and many of us are choosing not to move, that we will put a more personal stamp on our homes. So if the neutrals are out, look out as the nation takes more risks with other features in our rooms such as carpets, sofas, curtains etc. We could be in for a colourful time! Would you employ this man??! !